Today I get the pleasure of introducing a new die that will be released on Feb. 15th by Papertrey Ink called Button Stacks. There really is so much you can do with this die! 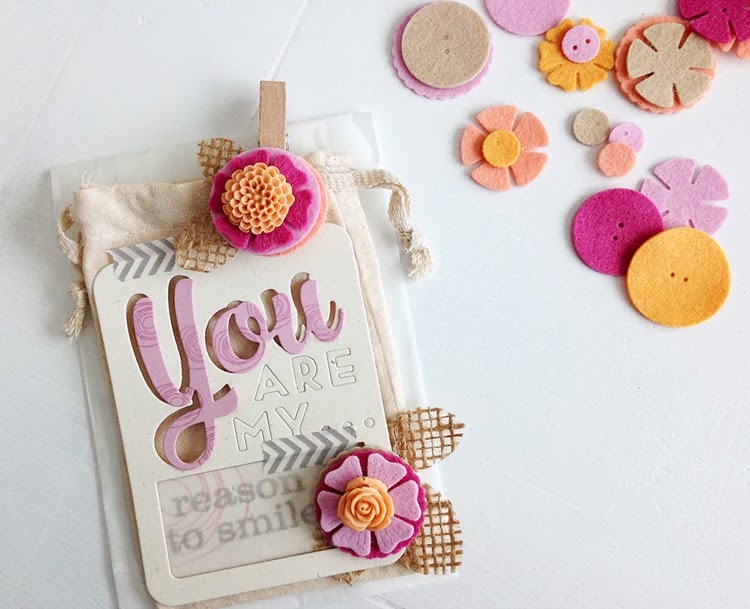 Cut them from paper, felt, any sort of medium to create your own unique stacked embellishments! 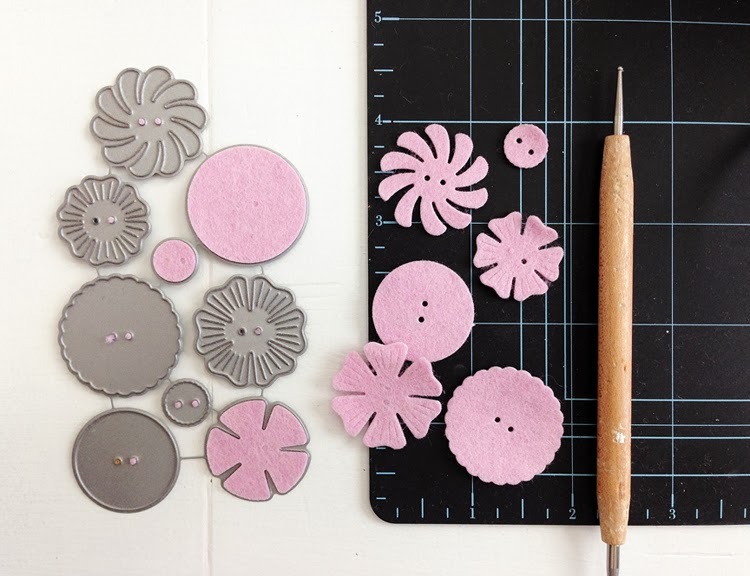 I've made a couple of little button stacks with felt here and topped them with resin flowers from Papertrey Ink's Boutique shop. One is attached to a clothespin, which holds this tag onto a small cotton bag. The tag is cut with a new die coming out this month called Phrase Play #1. This die would be so cute in a pocket page for scrapbooking also or on a card! I cut the tag from Lavender Moon cardstock also and stamped it with Circle Scribbles. I cut a few different colors of felt with the Button Stacks die and just played around with mixing and matching the color stacks. Look at all those cute shapes! The leaves you see above were cut with burlap and another new die called Leave It Be, also available on 2/15. 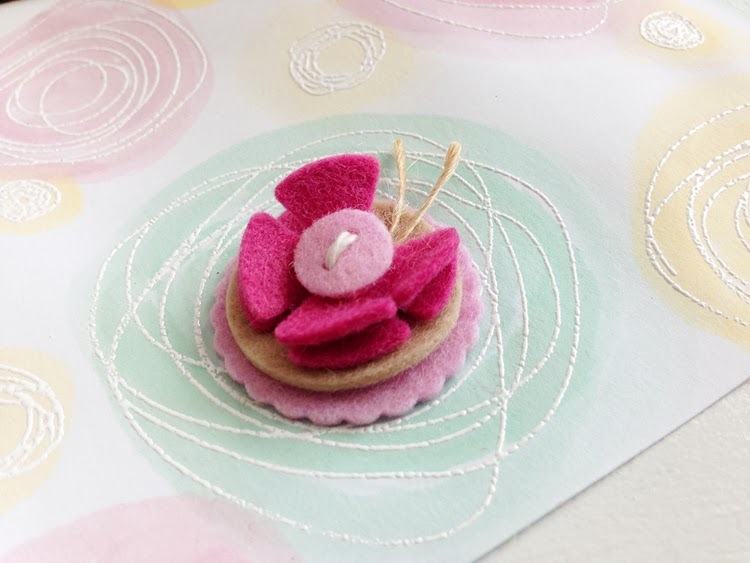 These dies cut Papertrey Ink's wool felt so nicely, and the felt comes in every color to match the inks and cardstock! I've tried other felt from the craft store, but it's not as dense as this felt, so it doesn't cut as clean as Papertrey Ink's felt. 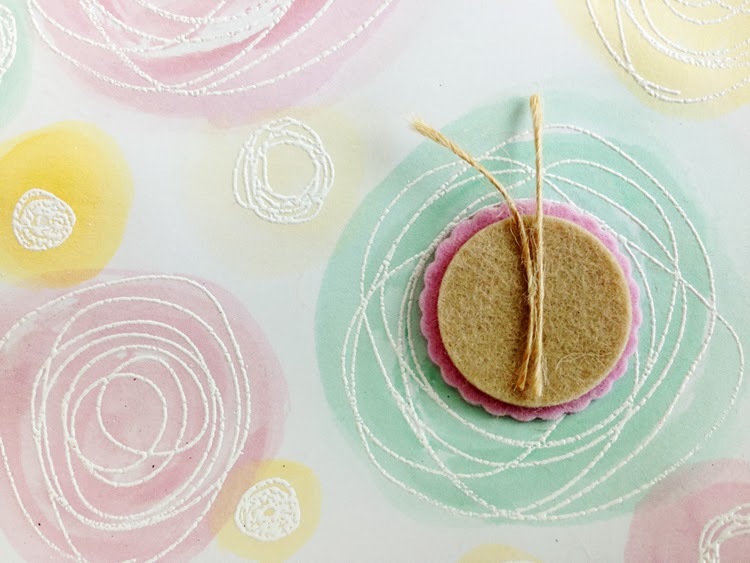 Autumn Rose/Lavender Moon/Classic Kraft/Summer Sunrise felt, washi tape - unknown. 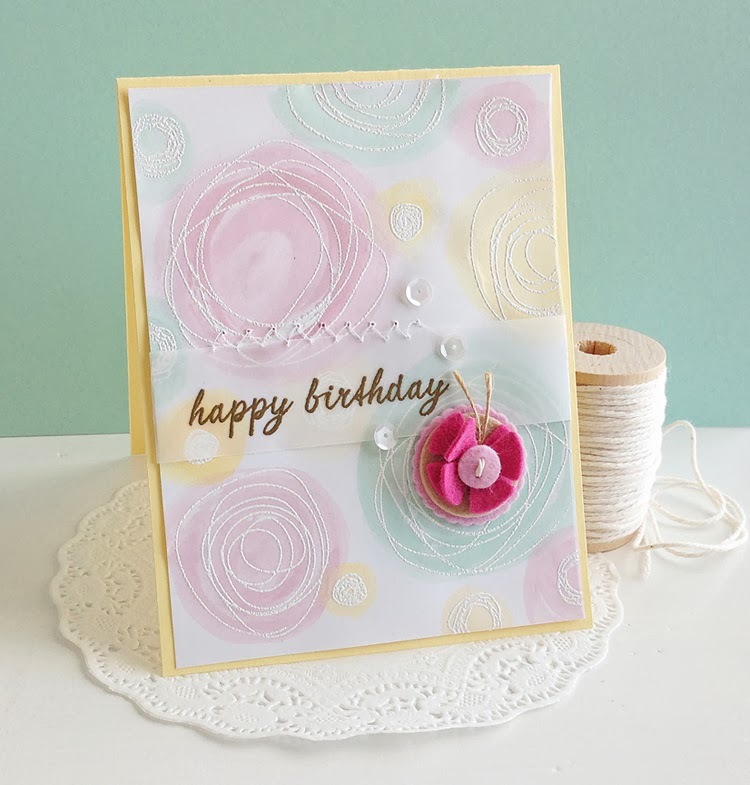 On the next card, I used a new stamp set called Circle Scribbles in the background with a Button Stacks butterfly embellishment that I made. 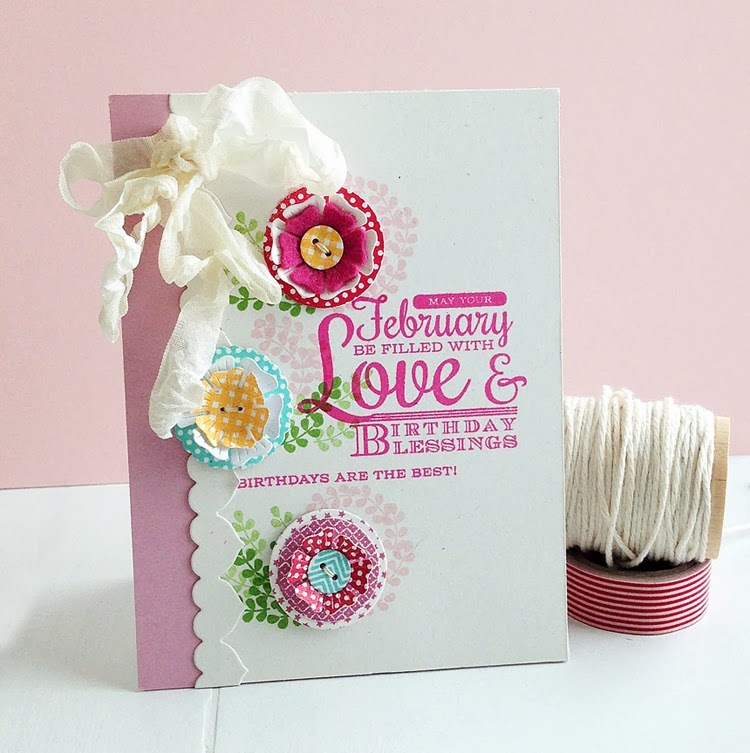 I stamped and heat embossed the Circle Scribbles images with white embossing powder. Then I painted over the top with Lavender Moon, Aqua Mist and Harvest Gold ink refills. I dipped my brush in a little bit of water, then the ink color and painted it on. 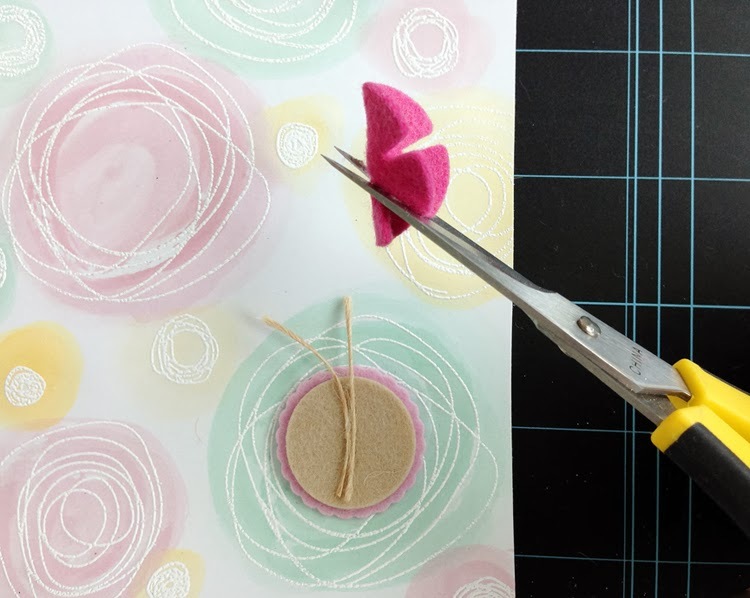 To create the butterfly embellishment, first I used the Button Stacks die with Papertrey Ink felt, then added some twine antennae. 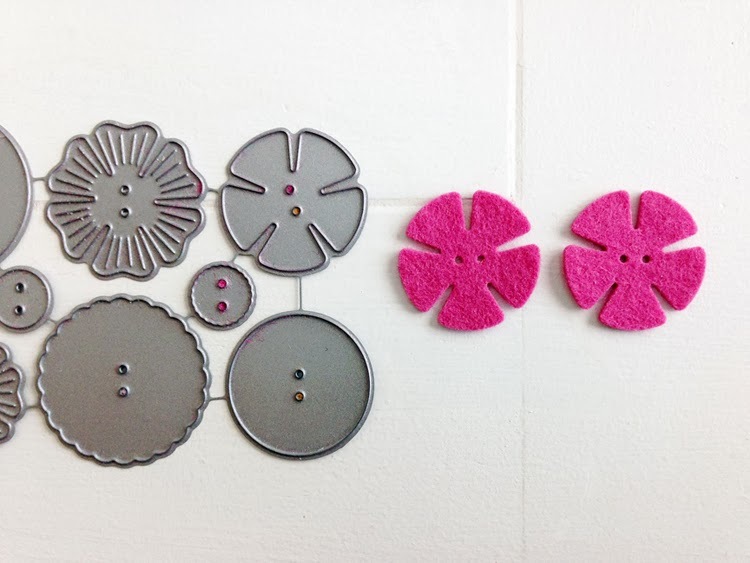 Next, I cut two of these felt flowers with the Button Stacks die. Place the two together in the center, and top with a smaller button from the Button Stack die on top. You have yourself a butterfly! I added the stamped sentiment on vellum, heat embossed it with gold detail embossing powder. Last, added a few sequins from Pretty Pink Posh. These colors would make a cute Easter card as well! OTHER: White and gold detail embossing powder, twine, sequins by Pretty Pink Posh, Autumn Rose/Lavender Moon/Classic Kraft felt, reinkers in Harvest Gold, Aqua Mist and Lavender Moon. On the last one, I die cut my Button Stacks with white cardstock, then stamped designs on them! I used Bitty Background Blocks and Bitty Background Blocks II stamp sets to stamp on the buttons. Aren't they fun? The paper ones are so cute all stamped and stacked. I love this concept! 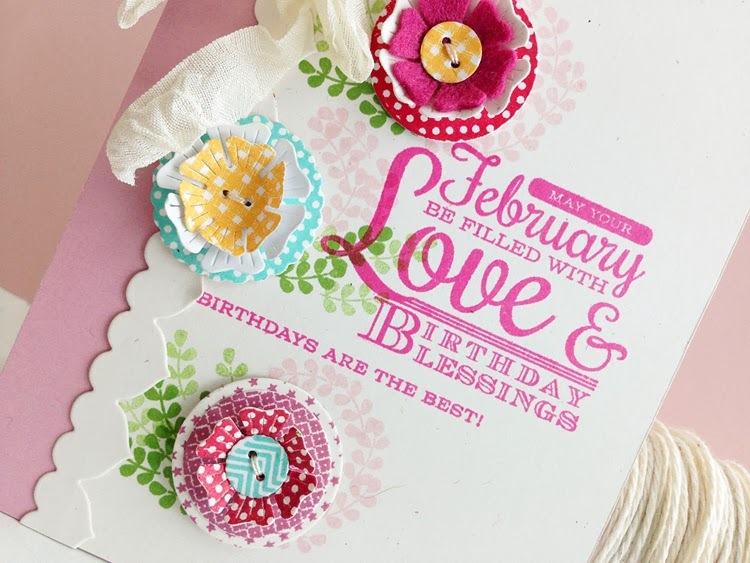 I used the little leaf stems from a new stamp set called Sweet Speech to stamp around the button stacks, and for the sentiment, I used a new set called Birthday Classics: February coming out this month as well. OTHER: floss - craft supply, seam binding - Zipperstop. Visit Nichole Heady's blog to see more sneak peeks! All of these new products will be available on Feb. 15th at 10pm EST at Papertrey Ink. Thanks for swinging by today! Oh Danielle, these cards are so very gorgeous! I love the Button stacks...now I might use all the Papertrey felt I have! Your cards are absolutely amazing! I love each and every one! I'm gasping here! An overabundance of gorgeousness. Each card is breathtaking, but the first one? With those colour combinations? Mind blowing! Oh your painted scribble card is so subtle and gorgeous!!! Beautiful!!!! your cards are wonderful - so much potential in those button stacks! Fabulous projects, Danielle! I wasn't sure about the scribbled circles set, but you are totally selling me on them! And those button stacks look great -- I love how you used them! Your cards are amazing and I am feeling pure love for that die set!! Your cards are absolutely beautiful! Love the felt butterfly! 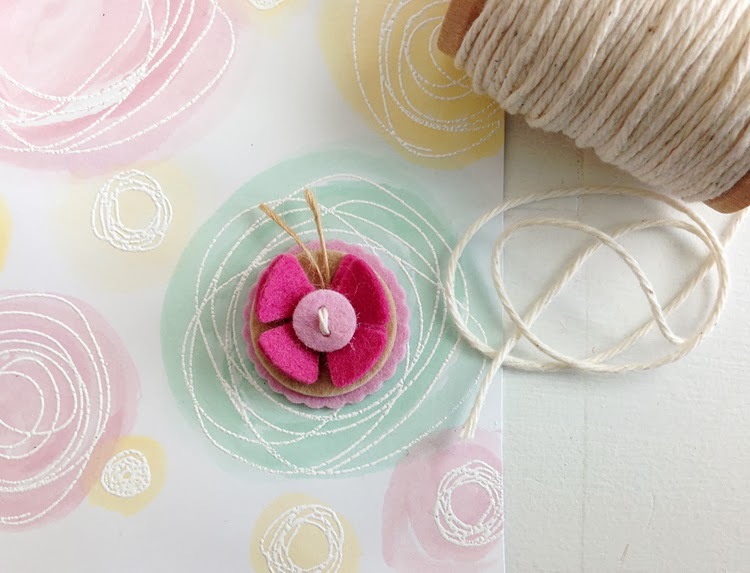 Buttons and felt and flowers, Oh, MY! Thanks so much for sharing and enabling/inspiring!!!! Love, love, love all you did today. Those flowers and butterfly are gorgeous. Thanks for the inspiration. 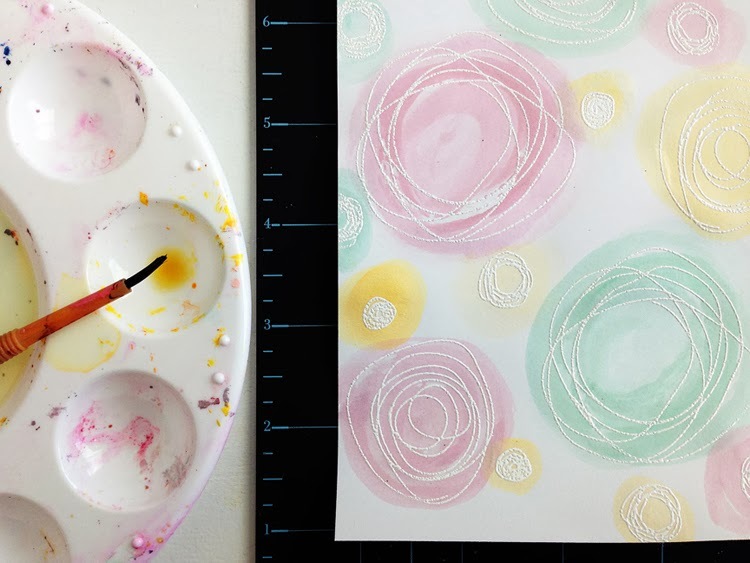 Love today's projects, especially the card with the watercolored scribbles. I really like how you layered the dies and paired them with other layering products. All of these are GORGEOUS! I especially LOVE the one with the scribbled circles and felty butterfly embellishment! So dreamy and pretty!!!! Just gorgeous every one. One day you need to do a video of how you scrunch up and attach your ribbon. I love that look but can't seem to recreate it. oh danielle, they are beautiful! what a sweet little set! LOOOOOOOOOOOOOOOOOVE them so sweet gorgeous and cute! These are so beautiful! Couldn't pick a favorite if I had to. Amazing projects today, Danielle! 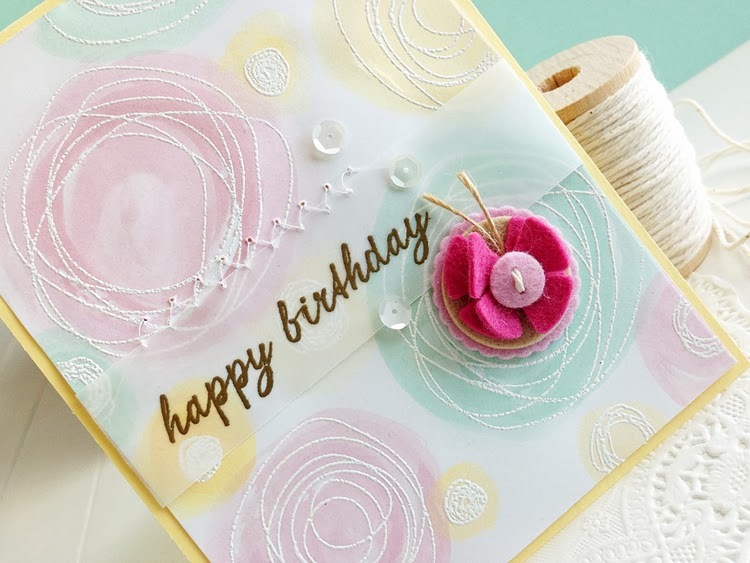 I love the card with the butterfly embellishment and oh the sweet burlap bag at the top...it is so quaint and adorable! 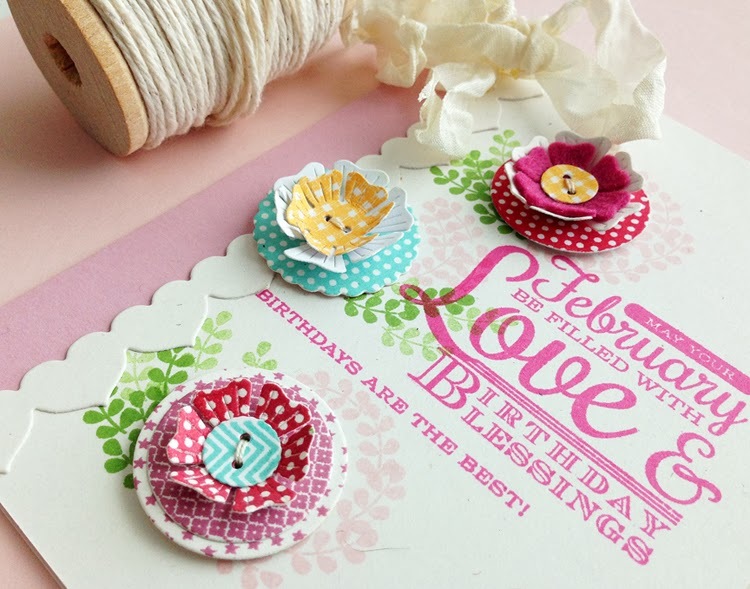 Love these cards & HAVE TO HAVE those Button dies! So cute! 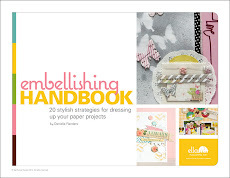 Danielle all of your projects are so fabulous--love that new die and the possibilities! Everything is awesome! 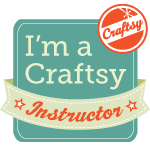 So many fun ways to create! Oh my!! All your projects are STUNNING!! I so want those button dies!! Such beautiful work! i just love your colors! Gorgeous - love your felt butterfly - just stunning!